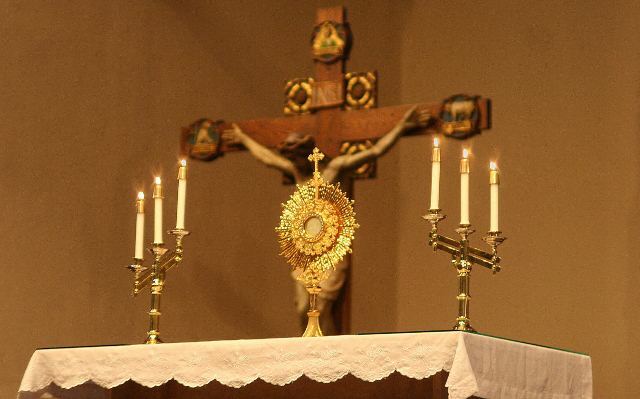 Eucharistic Adoration is loving and faith-filled worship of the Lord outside of the Mass. Christian faith from the very beginning of the Church's history has been that the Lord Jesus is not only spiritually present but substantially present (that is, the whole Christ: Body, Blood, Soul, and Divinity) in the consecrated Host (the Blessed Sacrament or Eucharist). It is like the difference between reading a friend's letter (so that your friend is spiritually present) and having that friend actually in front of you (so that your friend is substantially present); that fullest presence is what is meant by Christ's "Real Presence," the living, resurrected, glorified Christ is completely and substantially present, but hidden in the sacramental "species" of what looks like Bread and tastes like Wine. 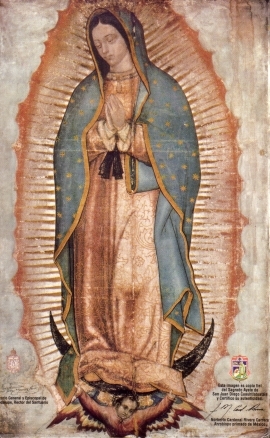 In Eucharistic Adoration, the consecrated Host (the Lord Himself) is shown in a special "frame" called a "monstrance" (from a Latin word meaning "to show"), so that we can look upon the Blessed Sacrament and ponder the profound humility of a God who becomes Man and makes Himself fully present in what only appears to be mere Bread. Eucharistic Adoration nurtures our relationship with Christ because He as God chooses to make His influence upon a soul dependent on the depth of that person's faith, just as in the Gospels His miraculous healings depended on people's belief in Him. Eucharistic Adoration is also the most effective prayer outside of the Holy Mass because it is linked intrinsically to the Holy Sacrifice of the Mass, which in fact makes present the whole Christ in the consecrated Host, and after the Holy Mass, He remains alive and full of love for you to visit Him either "exposed" for Adoration in the monstrance or reposed in our tabernacle and in every Catholic church around the world. St. Alphonsus Liguori said, "Certainly amongst all devotions, after that of receiving the Sacraments, that of adoring Jesus in the Blessed Sacrament holds the first place, is the most pleasing to God, and the most useful to ourselves. Do not then, O devout soul, refuse to begin this devotion; and forsaking the conversation of men, dwell each day, from this time forward, for at least half or quarter of an hour, in some church, in the presence of Jesus Christ under the sacramental species. Taste and see how sweet is the Lord." The Eucharistic presence of Christ begins at the moment of the consecration and endures as long as the Eucharistic species subsist. Christ is present whole and entire in each of the species and whole and entire in each of their parts, in such a way that the breaking of the bread does not divide Christ [like seeing the same reflection in several shards of a mirror]. Worship of the Eucharist. In the liturgy of the Mass we express our faith in the real presence of Christ under the species of bread and wine by genuflecting or bowing deeply as a sign of adoration of the Lord, and in other ways. "The Catholic Church has always offered and still offers to the sacrament of the Eucharist the worship of adoration, not only during Mass, but also outside of it..."
The tabernacle was first intended for the reservation of the Eucharist in a worthy place so that it could be brought to the sick and those absent outside of Mass. As faith in the real presence of Christ in his Eucharist deepened, the Church became conscious of the meaning of silent adoration of the Lord present under the Eucharistic species. The Church and the world have a great need for Eucharistic worship. Jesus awaits us in this sacrament of love. Let us not refuse the time to go to meet Him in adoration, in contemplation full of faith, and open to making amends for the serious offenses and crimes of the world. Let our adoration never cease. "That in this sacrament are the true Body of Christ and His true Blood is something that 'cannot be apprehended by the senses,' says St. Thomas, 'but only by faith, which relies on divine authority.' For this reason, in a commentary on Luke 22:19 ('This is My Body which is given for you. '), St. Cyril says: 'Do not doubt whether this is true, but rather receive the words of the Savior in faith, for since He is the Truth, He cannot lie.'" Please help pray for the spread of Perpetual Adoration in our diocese! Pray wherever you like! Click here for more information. As part of the New Evangelization, our deanery is starting a Perpetual Eucharistic Adoration (PEA) chapel. Perpetual Adoration brings peace, graces, answers, renewal in parishes, vocations, even miracles. Fulton-Montgomery deanery’s Perpetual Adoration chapel, God willing, will be in Holy Spirit Church’s "Lady Chapel" (except during Masses and weddings). More info on PEA is at www.therealpresence.org. May the Lord bless you and deepen your love for the Holy Eucharist!